The popular Seven Seas Food Festival is returning to SeaWorld in February! As guests sip and sample their way through the park, they will discover globally-inspired flavors while enjoying local craft beers and beverages from around the world. The fun goes beyond the food with live performances at Bayside Stadium featuring top artists. The festival will run every weekend between the 9th February and 5th of May. Plus new for 2019 from 15th Feb guests will be able to enjoy the festival on Friday evenings from 4pm – 9pm. There’s so many tempting cocktails and non alcoholic beverages on offer too to quench your thirst. Every Saturday and Sunday during the festival there will be concerts at Bayside Stadium (included with your admission) SeaWorld have only announced the first 6 weeks of performers and we will update you as soon as we know any more!! Stay tuned for more updated and performance announcements! 52 weeks of events at SeaWorld Orlando in 2019! 2019 is set to be BIG for SeaWorld parks and entertainment, with Sesame Street due to open at SeaWorld, Tigris to open at Busch Gardens, KareKareKurl to open at Aquatica plus much more and now SeaWorld have revealed 9 events that will cover the whole of 2019! There wont be a week next year that an event won’t be happening in SeaWorld! Oh yeah and it’s ALL included with admission!! Check it out.. Families are invited to help commemorate the arrival of the Three Wise Men during SeaWorld’s Three Kings Day celebration. This festive event brings SeaWorld’s Christmas season to an incredible close with speciality cuisine and celebratory experiences that honour the cherished traditions of Latin cultures. Taking place twice in 2019, guests can go behind the scenes and visit areas never opened to the public during this new event. SeaWorld’s renowned veterinarians and animal experts will offer an intimate look at the day-to-day care they provide for animals large and small. Visitors will also get to meet the SeaWorld Rescue Team and learn more about their life-saving work. SeaWorld is the place to be for Elmo’s Birthday Celebration, featuring an interactive DJ dance party, fun party games and surprise visitors. Don’t miss this weekend-long party for Elmo as we prepare to welcome the brand-new Sesame Street at SeaWorld in spring 2019! The popular Seven Seas Food Festival is returning to SeaWorld in the spring with more to love. As guests sip and sample their way through the park, they will discover globally-inspired flavors while enjoying local craft beers and beverages from around the world. The fun goes beyond the food with live performances at Bayside Stadium featuring top artists. As the sun goes down, the park comes alive with the glow of Electric Ocean at SeaWorld, returning next year for another summer of fun. With exciting nighttime shows and electrifying music, guests are immersed in a sea of wonder that ends in “Ignite”, a spectacular finale with fireworks, lasers and fountains. The SeaWorld Craft Beer Festival extends to four weekends in 2019, featuring 100+ brews on draft at locations around the park. Guests will enjoy unique food items designed to perfectly pair with the festival’s brew selection. New surprises await at Orlando’s biggest family-friendly Halloween event. Guests of all ages can celebrate with the all-new Sesame Street Halloween Parade, featuring fantastic floats, crowd-pleasing performances and everyone’s favourite furry friends. Families will also enjoy a Halloween Dance Party, trick-or-treating around the park and the opportunity to meet whimsical characters inspired by the sea. With the return of Praise Wave, guests can enjoy live concerts from the hottest names in Christian music, lighting up the stage at SeaWorld. The joys of the holiday season come to life at SeaWorld. More than 3 million lights blanket the park in holiday cheer as guests immerse themselves in the sight, sounds and tastes of the season. The event features stunning live shows, scrumptious festive treats and opportunities to visit Santa Claus and Rudolph the Red-Nosed Reindeer. I think it’s fair to say that no matter what time of year you’re visiting SeaWorld in 2019, you’ll have a blast!! I think it’s fair to say that we are allowed to start being excited about Christmas now, right? Well anyway, we are and to add to our excitement, SeaWorld have just released information on their Christmas Celebrations and this year there’s going to be more lights than ever before and by more we mean over 3 million! Running from the 17th November through to the 31st December make sure you don’t miss out on all of the festivities SeaWorld have to offer. Get ready to enjoy scrumptious food, stunning live shows, and joyful entertainment. Winter Wonderland on Ice – Christmas comes to life on a stage of ice, jewels, and lights as skaters dazzle and delight in this show-stopping ice-skating extravaganza. A sea of sparkling trees and towering fountains dancing in the background come together to create a don’t-miss experience the entire family will enjoy. Sesame Street’s Elmo’s Christmas Wish – The festive period arrived and everyone’s Sesame Street friends have come to SeaWorld Orlando for a festive and fun musical celebration. Elmo’s Christmas Wish will soon become every child’s favourite show. Join Cookie Monster, Grover, Zoe and Rosita as they work together to help Elmo find his Christmas wish. Shamu Christmas Miracles – Celebrate yuletide alongside majestic orcas as Shamu Stadium is illuminated with dazzling lights and glowing candles while Christmas carols abound. O Wondrous Night – Experience a live nativity only SeaWorld can bring to life, complete with more than 30 carols, life-sized puppets, and animals in a spectacular Christmas favourite based on The Christmas Story. Told through the eyes of the animals that were there, O Wondrous Night is a touching, light-hearted, and glorious musical with a host of angels, animals, and the shine of Christmas. The Christmas Market – Nestled along the park’s Bayside Pathway, The Christmas Market features festive entertainment and delicious culinary delights. Complete with playful elves, a charming model train village, and seasonal entertainment, the market is the centrepiece of SeaWorld’s Christmas event. Guests can also relax near the warm glow of the fire pit with a holiday cocktail while experiencing a wonderful view of the vibrant Sea of Trees. Can’t wait for this! Especially Snow Flurries at Waterfront and to meet Rudolph! SeaWorld Parks and Entertainment are on a bit of a tear at the moment, not only have the officially launch Infinity Falls today but they’ve also announced a new trill ride is heading to Aquatica in 2019. KareKare Curl is a 2 person raft ride which will have a weightless feel about it. Aquatica was recently voted the top water park in the U.S. via a national poll and with this years introduction of Ray Rush and now the plans for KareKare you can see why! 2019 looks like its going to be a great year to visit Orlando! What can we expect from the SeaWorld parks in the next couple of years? Lets take a look at all of the confirmed and rumoured attractions coming to the SeaWorld parks (SeaWorld, Aquatica and Busch Gardens) in the next few years! This was supposed to open in summer this year however we are still patiently awaiting the chance to be able to ride this awesome raft attraction! It’s going to feature the worlds tallest river rapid drop of 40ft! We cannot wait for this new coaster! It’s going to be Florida’s tallest launch coaster and will feature a TRIPLE LAUNCH with both forward and backward motions. Sesame Street is set to transport guests into the colourful and creative world of Sesame Street through immersive theming, character interactions and interactive play. There are lots of rumours flying around that SeaWorld’s next big attraction is going to be a coaster (first once since Mako which opened in 2016) the coaster is rumoured to be similar to Wave Breaker Coaster at San Antonios SeaWorld! If this one is true then i’m all for it! When Busch Gardens announced Tigris the other day they also let slip a little secret which is that Gwazi is going to be revamped into a ride that will make you want to ‘hold on to your seats’ Yippeeee! SeaWorld really know how to bounce back don’t they! I hope the rumours are true too! Sesame Street is coming to SeaWorld Orlando and Busch Gardens Tampa for a Halloween season of not-too-spooky fun for families this autumn. Guests of all ages can join everyone’s favourite furry friends from Sesame Street as Count von Count, Elmo, Abby Cadabby and others take to the stage in ‘Sesame Street’s Countdown to Halloween’ show, where the Count is feeling lonely and it’s up to the audience and the loveable monsters from Sesame Street to get him into the Halloween spirit. Batty bats and spooky skeletons join the fun in a song-filled stage show that invites families to dance, play and sing along. Pets Ahoy is getting its own seasonal twist and you will even have the chance to meet a mermaid in the mermaid grotto. It starts on the 22 September and children can dress in Halloween costumes and take part in fun-filled trick-or-treating in the park. At Busch Gardens, Sesame Street Kids’ Weekends are also returning every weekend in October, including half term. Children are again welcome to dress in Halloween costumes and dance along as Count von Count serves as master of scare-emonies to lead his Sesame Street pals through his favourite tunes in the new stage show. There will also be autumn-inspired activities at Gwazi Field in Busch Gardens, including a hay maze, pumpkin ring toss and much more. Families can even opt to dine with Sesame Street characters at both theme parks. At Busch Gardens, the ‘Lunch with Elmo and Friends’ buffet every Saturday and Sunday during the Halloween season will let children enjoy hugs and high fives with sing-a-longs, dance parties, and special photo opportunities. At SeaWorld, ‘Count von Count’s Spooktacular Breakfast’ features a delicious buffet enjoyed with the furriest characters in town. The breakfast is a fun-filled experience sure to delight kids and parents alike. Character dining requires an additional reservation. Explore, celebrate and play: SeaWorld Parks & entertainment have just released some more information on Sesame Street which is coming to SeaWorld in Spring 2019. Also, for the first time ever at SeaWorld there will be a daily parade that is set to feature, yep you guessed it.. Elmo and his friends. As well as the daily parade kids and big kids alike will be able to visit re-created sets from Sesame Street such as Big Birds nest, Mr Hoopers Store and 123 Stoop. There will also be rides and play areas too! It is expected that the new rides will be announced in the forthcoming months. Taken from our post back in February this year: It has been speculated that there is going to be a dark ride added to this section of the park, as a few large building have been noticed on some building plans. There has been rumours that SeaWorld have been in talks with The Goddard Group who have worked on projects like Spider-Man and T2 so maybe this could be a hint toward a dark, Sesame Street ride which will be unique for SeaWorld Orlando as there is certainly not a lot of indoor ‘show scene’ rides since the animatronics on Journey to Atlantis stopped. Back in May we found out that in a few years we could be seeing a realistic version of Sesame Street. The new Sesame Street Land is set to replace Shamu’s Happy Harbour at SeaWorld. In May SeaWorld said that the new land would be open by 2022 but that was about all we got specifics wise and now it seems as though work could start as early as this year. You will find Sesame Street lands at SeaWorld San Diego, San Antonio and at Busch Gardens but these mainly feature just the characters – the areas aren’t generally themed. The Sesame Street land looks as though it is going to be a mix of new and existing attractions and structures. Most of the attractions along the outside of the area will remain and the interior of Shamu’s Happy Harbor will be almost completely renewed. It is bellieved that the new land will open in late 2020, with the full area opening roughly two years after that (2022). According to the documents uncovered by Touring Central Florida the majority of the current Shamu’s Happy Harbor flat rides will remain such as the Shamu Express, Flying Fiddler, Jazzy Jellies, Ocean Commotion, Sea Carousel, and the Swishie Fishies. It is highly likely that the rides will get updated to be more Sesame Street themed. It has been speculated that there is going to be a dark ride added to this section of the park, as a few large building have been noticed on some building plans. There has been rumours that SeaWorld have been in talks with The Goddard Group who have worked on projects like Spider-Man and T2 so maybe this could be a hint toward a dark, Sesame Street ride which will be unique for SeaWorld Orlando as there is certainly not a lot of indoor ‘show scene’ rides since the animatronics on Journey to Atlantis stopped. The Sesame Street land will be one of the largest investments in the parks history and continues to move away from live animals, infact, from the plans it doesn’t look as though there is going to be any live animal habitats in the land. 2017 has nearly come to an end, we’ve had loads of cool new attractions / parks arrive in Orlando this year such as Volcano Bay and Pandora – The World of Avatar and lucky for us 2018 is not going to disappoint either with loads of new rides set to open in the coming year. I’m going to start with Hollywood Studios as we are eagerly awaiting the opening of Toy Story Land here at OAT towers. Two new rides and a food spot have been officially named for Toy Story Land which is opening in the summer of next year; Slinky Dog Dash – a family coaster where you will find yourself zipping, dodging and dashing around a track that Andy has created to stretch Slinky to his limits. Alien Swirling Saucers where aliens will be flying around in their saucers trying to capture your rocket toy vehicle with ‘The Claw’ and Woodys Lunch Box which will be a quick service window to grab some of Andy’s fave food. Next up is Universal Studios where Fast & Furious – Supercharged is set to open in Spring. Now this is one i’m personally super excited about as I LOVE the Fast & Furious films. Guests will be immersed in their own Fast and Furious story, escaping the enemy with familiar faces such as Dom, Letty and Hobbs. The new ride will also feature a Virtual Line just like in Race Through New York Starring Jimmy Fallon. SeaWorld is also opening a brand new ride in the summer called Infinity Falls. Infinity Falls is a river rapids ride with a twist. It will be a 4+ minute ride featuring a 40ft plunge down the tallest drop of its kind. Riders will get to experience the excitement and thrills of category 4 white water rapids and use a ‘unique elevator lift’ which will create the worlds tallest drop on a river raft ride. Aquatica is also debuting a brand new ride; Ray Rush. This ride is set to open in Spring and will be the only water ride in Florida to offer a water jet propel system which will launch riders (4 at a time) at 33 feet per second. It will have a height requirement of 42”. LEGOLAND are also in the mix of opening new rides in 2018 with The Great LEGO Race: Opening in Spring – a new virtual-reality roller coaster adventure. This new coaster will feature virtual reality technology, a cast of wacky LEGO minifigures and is replacing the current Project X coaster. Personally, the one i’m most looking forward to is Fast & Furious – Supercharged. Whats yours? During the all-new Three Kings Day celebration, families are invited to help commemorate the arrival of the Three Wise Men. The new event brings SeaWorld’s holiday season to an incredible close with festive cuisine and celebratory experiences that honour the cherished traditions of Latin cultures. With the return of Praise Wave, guests can celebrate Christian fellowship and fun at SeaWorld Orlando. Uplifting, live concerts from the hottest names in Christian music will light up the stage at Nautilus Theatre. After a delicious debut last year, the Seven Seas Food Festival is returning to SeaWorld this spring for a second course. As guests sip and sample their way through the park, they will discover globally-inspired flavours while enjoying local craft beers and culinary marketplaces. The fun goes beyond the food with live performances from top country, rock and Latin music artists each weekend. Families will enjoy dancing to the beat and learning together along with everybody’s favourite furry, finned and flippered friends during these special weekends crafted with young guests in mind. As the sun goes down, the park comes alive with the glow of Electric Ocean at SeaWorld, returning next year for another summer of fun. With exciting night time shows and electrifying music, guests are immersed in a sea of wonder that ends in “ignite,” a spectacular fireworks finale. During Orlando’s premier daytime Halloween event, guests of all ages can join everyone’s favourite furry friends from Sesame Street as The Count, Elmo, Abby and others take the stage in Sesame Street’s Countdown to Halloween. Families will also enjoy a Halloween Dance Party, trick-or-treating around the park, and the opportunity to meet whimsical characters inspired by the sea. 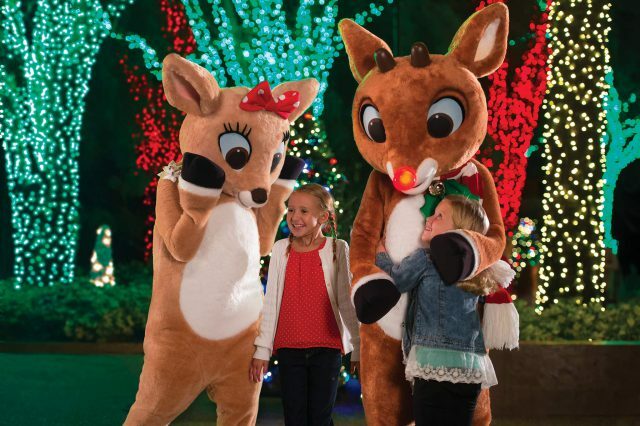 At SeaWorld’s Christmas Celebration, guests experience the joys of the holiday season complete with Rudolph’s Christmas Town and returning favourites sure to inspire traditions for years to come. During SeaWorld’s Christmas Celebration guests of all ages can delight over scrumptious food, stunning live shows, joyful entertainment inspired by the natural world and much more. Pop all of these in your calendar now or even print it out to help plan your 2018 Orlando holiday!